D-Link are very well known for their networking products and I personally own a router, USB wireless adapter and an IP camera of that brand. The IP camera that I have is a pretty old one without a built-in webserver. All it does is capture and stream images without fancy features such as Dynamic DNS, motion detection, and auto sending captured images to an email address or FTP. So whenever I am not around for a couple of days, I will have to connect the IP camera to a Windows computer and set it up with a third party software such as webcamXP in order to receive notifications when a motion is detected. Although it works, but I find this method flawed because if there is a power failure, the computer will instantly shut down and will not auto startup when the power is restored. Other than that, I do not like to waste electricity because the computer has to be turned on 24/7 until I get back home. Fortunately the newer range of IP cameras by D-Link comes with a complete system with a built-in CPU and web server that transmits high quality video images for security and surveillance. It even has motion detection and notification via email feature built-in which means the IP camera can work independently without a computer connected to the camera. As good as it sounds, it would be better if we can take a look at the product’s control panel before buying because we don’t want to end up paying for something that doesn’t work like what we think it should. In Malaysia, I don’t think there are any computer shop that allows you to open up the new product box to test it before buying. 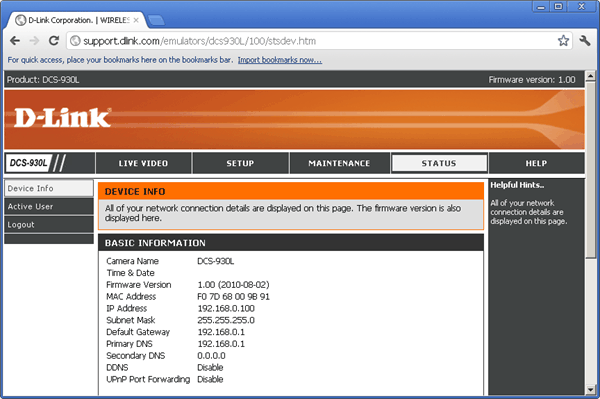 Thankfully D-Link has a free online emulator or simulator for some of their devices which includes the IP camera DCS-930L that I am thinking of buying. Currently there are 187 D-Link devices on the list. All you need to do is click on the model number and the demo control panel will open. It gives you a good idea on how to configure the device before buying it. Some of the simulator are screenshots while others are in HTML web page. After testing the demo of D-Link DCS-930L IP camera control panel, I am more confident to buy it and configure the auto email notification upon detecting a motion without connecting a computer to the camera and using a third party software to perform the actions.